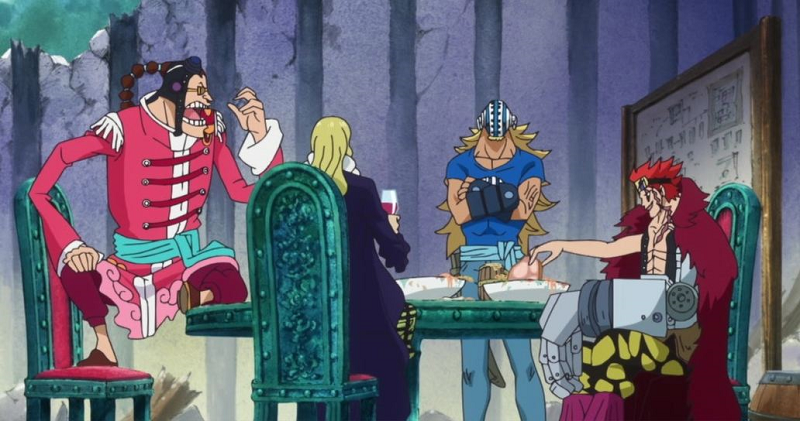 During the Punk Hazard Arc, three captains of the Worst Generation, Eustass Kid, Scratchmen Apoo and Basil Hawkins, met on the Kid Pirates’ base to discuss the terms of an alliance for the sole purpose of defeating Shanks. Their plans were shattered by Kaido. While it is unknown what happened between them, it appears that Scratchmen Apoo became a subordinate of Kaido as he informed him about Jack’s fate. Basil Hawkins joined the Beasts Pirates and became one of the crew’s Headliners. Kid, on the other hand, was badly beaten and imprisoned by the Yonko and his crew. At a later point, Kid somehow made his escape from the prisoner mine. The statuses of Killer and the Kid Pirates are currently unknown. Kaido is a black market customer of Donquixote Doflamingo. 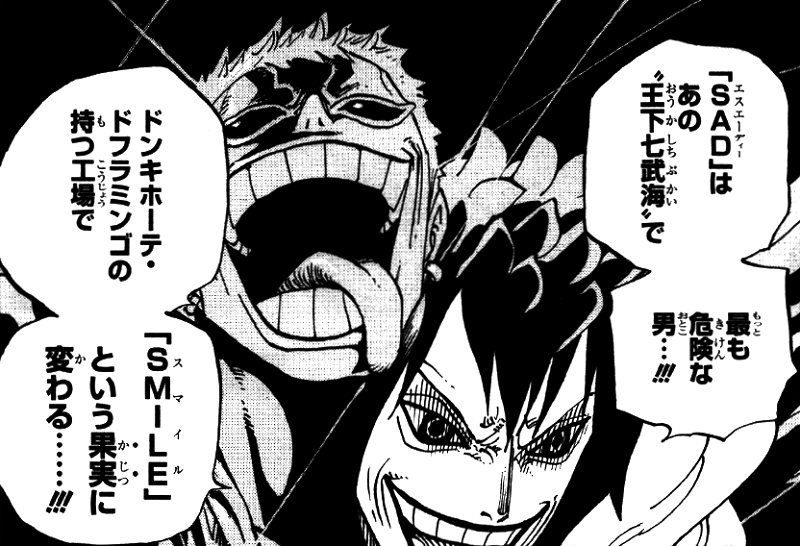 Caesar Clown produces and delivers large amounts of the substance SAD to Doflamingo, who uses it to manufacture artificial Devil Fruits called SMILES, which in turn are sold to Kaido to create his army of Artificial Zoan Devil Fruit users. With the destruction of Ceaser and Doflamingo’s operations, Kaido can no longer gain more Gifters for his army. 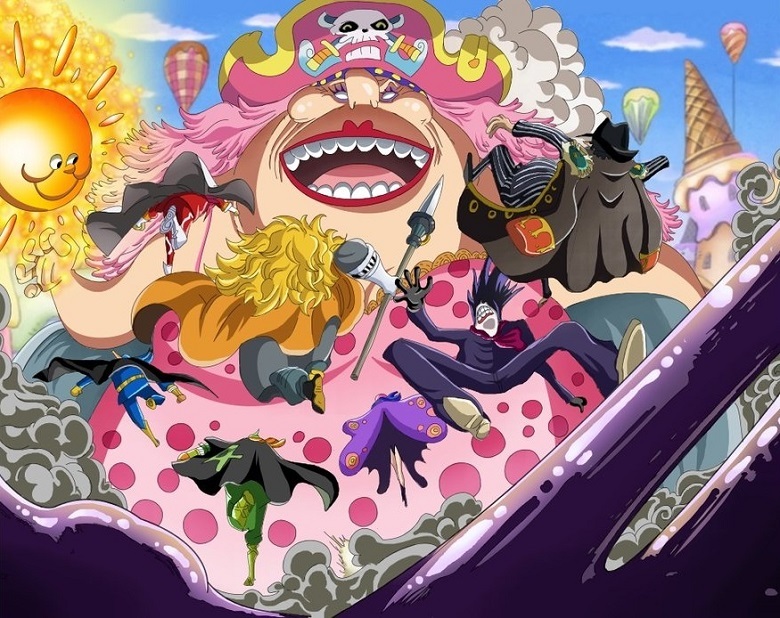 The Big Mom Pirates have various subordinate crews, some of which were already famed pirate groups in their own right. These formerly included the Sun Pirates, captained by a former Shichibukai, Jinbe, and the Fire Tank Pirates, captained by one of the Worst Generation, Capone Bege. Per Big Mom’s requirements, the vice captain of the Sun Pirates married her 21st daughter, while the captain of the Fire Tank Pirates himself married her 22nd daughter. In the event that a bride or groom from an outside family has multiple existing affiliations, they must sever those that are external to the political agreement with Big Mom. This was the case with Vinsmoke Sanji, whose membership of the Straw Hat Pirates was a loyalty outside the arrangement agreed between the Vinsmoke Family patriarch and the Charlotte Family matriarch, and which was therefore required to be forfeited. An alliance formed between the Sanji Retrieval Team and the Fire Tank Pirates. 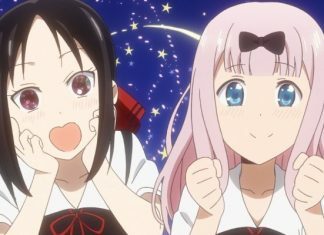 Both groups agreed to work together during Big Mom’s tea party. 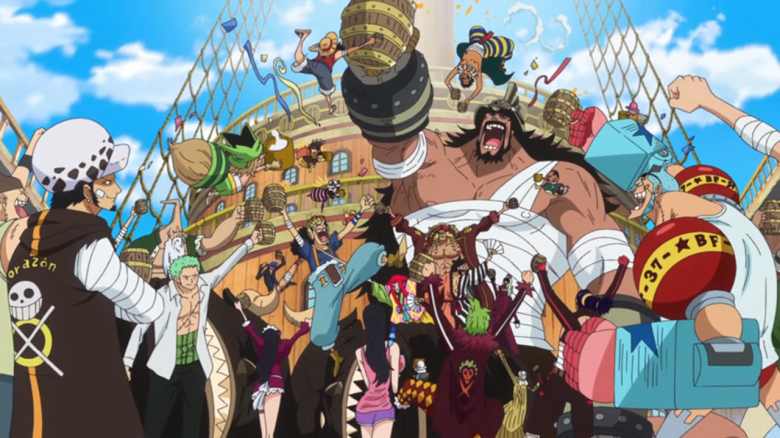 While the two groups share a common opposition to Big Mom, they have slightly different goals: The Straw Hats wanted to prevent Big Mom’s planned assassination of Sanji and his family during the event, while Capone Bege, captain of the Fire Tank Pirates, wanted to use the opportunity to take down Big Mom herself. The Straw Hat Grand Fleet is a fleet formed by seven organizations who vowed to serve under Monkey D. Luffy and the Straw Hat Pirates. Formed from various powerful crews who managed to succeed in the New World, and the representatives and some other members have been prime contestants of the Corrida Colosseum, the crew is immensely powerful indeed. In sheer numbers, they have a grand total of 5640 people from various tribes and races, being quite versatile in strength and other attributes. 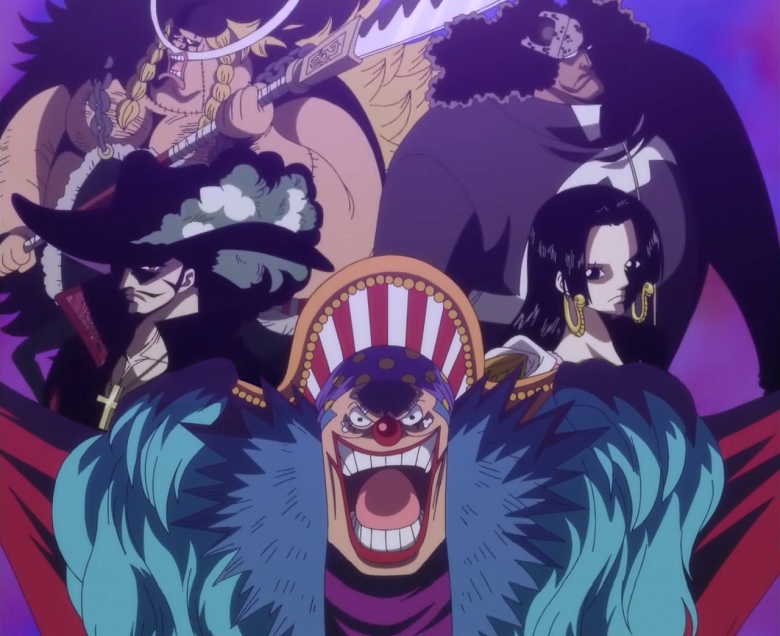 The seven leaders of the Grand Fleet are: Cavendish(Beautiful Pirates), Bartolomeo(Barto Club), Sai(Happo Navy), Ideo(Ideo Pirates), Leo(Tonta Corps), Hajrudin(New Giant Warrior Pirates) and Orlumbus(Yonta Maria Grand Fleet). 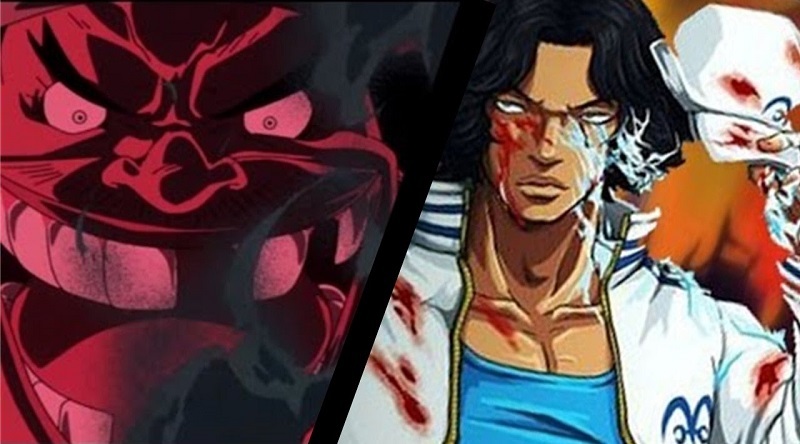 Kuzan, better known by his epithet Aokiji, is a former Marine admiral and the first one to be revealed. He was nominated by Sengoku for the position of fleet admiral. However, after losing the position to Sakazuki, he resigned from the Marines and affiliated himself with the Blackbeard Pirates. It is unknown what standing he has with the crew, but some like Jesus Burgess are not so quick to trust him because of his past as a Marine, but Blackbeard pays it no mind. The Shichibukai is an organization of seven of the strongest pirates in the world turned privateers in the service of the World Government. Although they work for the World Government, the Shichibukai themselves typically do not care about nor respect the Government or even other Shichibukai, and are often considered by the Marines to be no different from any other pirate. On the other hand, they are known as “government dogs” and are despised by other pirates, but are still feared and respected for their infamous reputation and strength which they gained before, and even after they become Shichibukai. 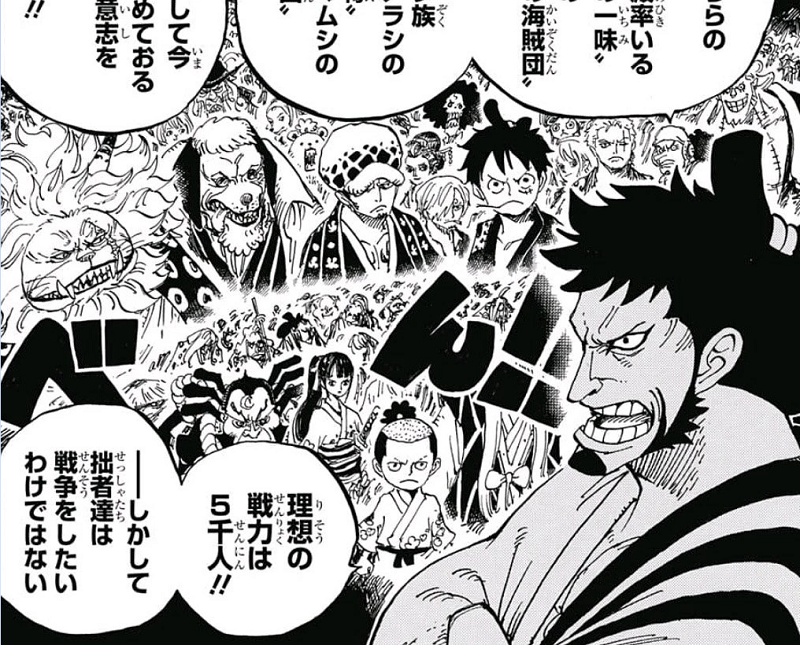 In the current situation, only 5 Shichibukai are remaining: Buggy, Dracule Mihawk, Boa Hancock, Edward Weevil and Bartholomew Kuma(currently, he is a slave-to-rent for the World Nobles). Fujitora recently met with the scientist Vegapunk, who revealed a new invention that the Admiral believes could render the Shichibukai system obsolete. 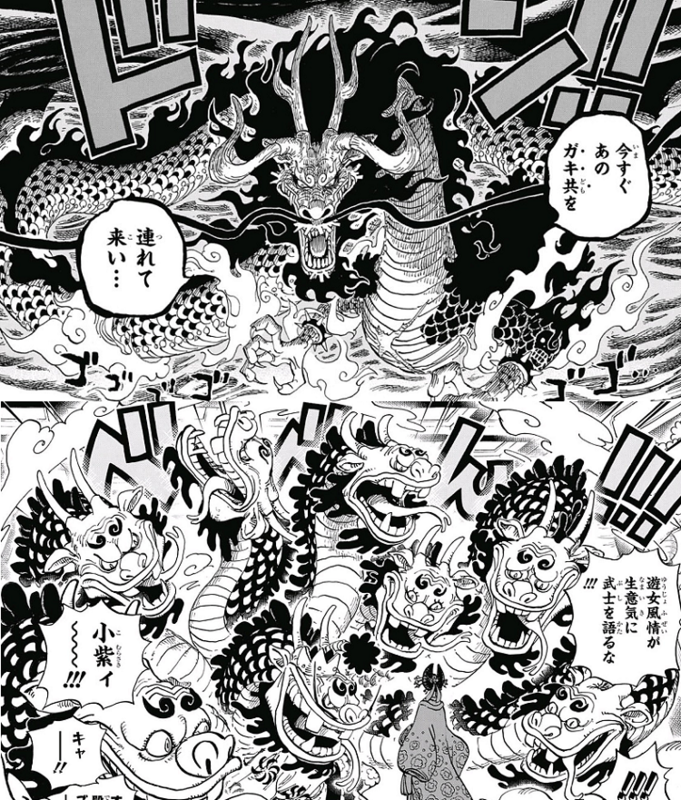 Kurozumi Orochi is the current shogun of the Wano Country. Orochi has many subordinates in Wano, including the Kyoshiro Family, a yakuza gang. All his men appear to be fiercely loyal to him. Orochi formed an alliance with Kaido, and together they executed the daimyō Kozuki Oden. Orochi seems to have a mutually beneficial cooperation with the Beast Pirates that enables him to maintain his authority and political power. Orochi purposely sacrificed most of the territory of Wano to be used by Kaido for his war preparations which allows him to utilize Kaido’s support to ensure his dominion. On Punk Hazard, the Heart Pirates and Straw Hat Pirates, two crews from The Worst Generation, formed an alliance. The respective captains, Trafalgar D. Water Law and Monkey D. Luffy, teamed up with the sole purpose of overthrowing Kaido of the Yonko. Upon reuniting with the other half of the Straw Hat Pirates on Zou, the alliance learned that the samurai of the Kozuki Family were fighting against Kaido as well, who is currently occupying Wano Country with the shogun there. 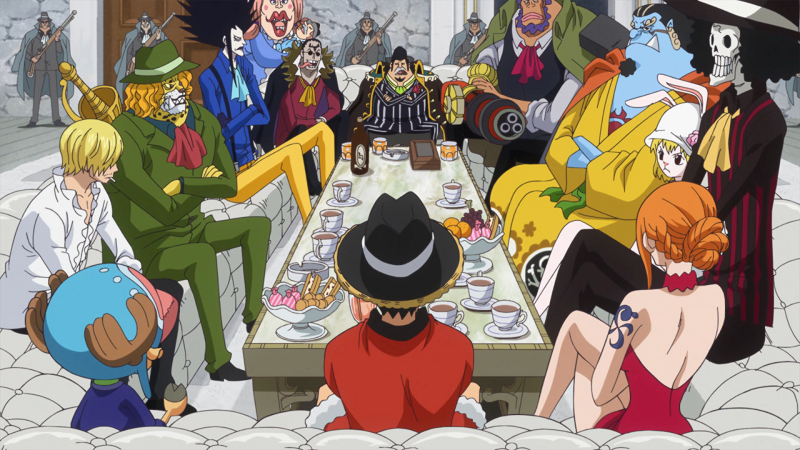 They requested to form an additional branch to the Heart-Straw Hat Alliance to take down the Yonko, and Luffy accepted, forming an alliance between the pirates, the Kozuki Family, and the Mink Tribe. Luffy dubbed this group as the Ninja-Pirate-Mink-Samurai Alliance. Kin’emon’s group worked on gathering allies and after Luffy’s group arrived at Wano Country, Kin’emon met up with them at the ruins of Oden Castle and revealed a plan to attack Onigashima, the island where Kaido resided, in two weeks. More than 40 years ago, before a certain man named Gol D. Roger took the Seas by storm, there was a pirate crew who supposedly stood above all other pirate crews. The Rocks Pirates! We first found out about their existence in chapter 907, stating that Big Mom and Kaido where members of this crew. According to “Vivre Card Vol.4”, some years before he founded the Whitebeard Pirates, Edward Newgate joined a “certain group of pirates”, which the card kinda implies to be the Rocks Pirates. It’s also implied to be the same group Bakkin was in. 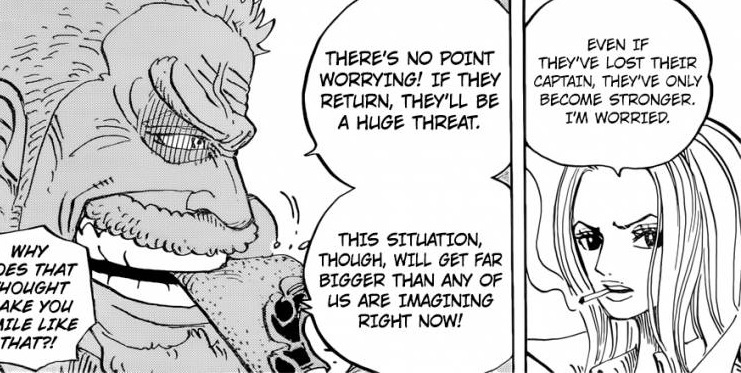 Rocks seem to have been incredibly powerful, given their prominence prior to Roger’s time and the fact that Garp could not imagine what the Marines would do if they came back into power!